I had a nice surprise this evening to discover that a letter I sent to BIKE magazine, Britain’s best selling motorcycle mag that also goes out to the US, made ‘Star Letter’ in the December issue. So here I am, back on a bike after 28 years and maybe I’m only back on it because I’m surfing a wave of resurgent motorbike consciousness that is sweeping the world. My decision to get a bike again seemed to happen overnight though doubtless it’s been festering since I sold my last one, my KH triple for just £90 to buy my soon to be betrothed an engagement ring only for it to be lost a month later on a girls night out. I’m not bitter. I hardly recall it. But look what’s happened. 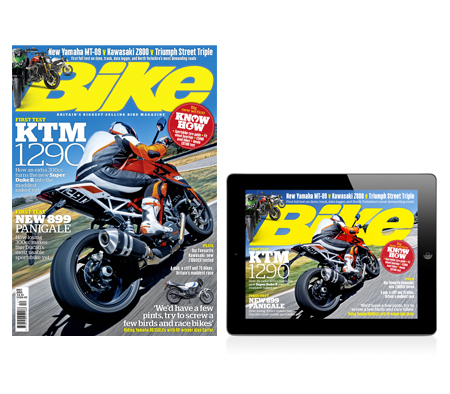 Bike magazine is rejigged, and wonderful I might add, and It’s lovely, though slightly disconcerting ‘at my age,’ to find oneself excited for the next issue, Marc Marquez storms in to Moto GP encouraging record crowds at Silverstone and even making my sister, persuaded to watch it on the tele, and who had never watched motorcycle racing before, to squeal and nearly spill her tea during a Marquez move. My sister doesn’t spill her tea for nobody, she’s a northerner you understand. Scott Redding is doing, what no Brit has done since Sheene, Yamaha launch the MT-09, Royal Enfield launch worldwide and electric bikes start making their mark. I came back in the nik of time it seems. I was thrilled once out on the road to find that head nodding is still part of biking and going strong though with a tad of snobbery it appears. Motorcycling is without doubt a parallel universe, not quite as separate as the parallel universe of canals and inland waterways but more like a matrixian, intertwining parallel and its for sure that bikers, in most part, regard each other as one big family. It’s rare that one won’t stop for another if broken down for instance and what keeps this family together is ultimately the head nodding. But there seem to be rules. My rule is that I nod at everything on two wheels without pedals, be it scooters, hogs, learners and even BMW’s and Harleys. I’m not sure whether, when a group of six pass by, you nod at each one. I do, but worry that the car driver behind might assume I’m having a seizure or listening to in-helmet Metallica and ring ahead for assistance. But it’s one of those things, it’s a hi. Hindu’s and new agers say ‘Namaste’ to each other when they meet which means ‘the being residing in me says hi to the being residing in you’ and head nodding is no different, it’s a biker saying ‘hi to the biker in you from the biker in me’ and not to nod, wave or acknowledge is a bit like letting someone through when in the car and they don’t wave a thanks. Pig ignorant. Learners seem particularly shocked when a bigger bike nods as if they have to be test-passed to get a bow. Learners are the nodders of the future and should be nodded to without exception. But some bikers will simply ignore you, like a mate or an acquaintance who crossed the road to avoid you even though you know he’s bloody seen you and so the first thing you do when you get home is unfriend him on facebook. It’s great to be back, right as things become very interesting.